This substantial 1940s vermeil sterling silver flower brooch adorned with aquamarine and ruby glass stones and diamanté accents is a fine example of the Retro Modern style. The petals of the flower have decorative cut-outs and are tilted and slightly curled, giving it lots of life. Designed by the remarkable Adolph Katz, this three-dimensional piece can be worn as a brooch or pendant. One photo shows the pendant on a black cord, but you may prefer a gold chain. A 17-inch, 2mm black rubber cord with a stainless steel twist lock (just like the one in the photo) is included with this purchase. 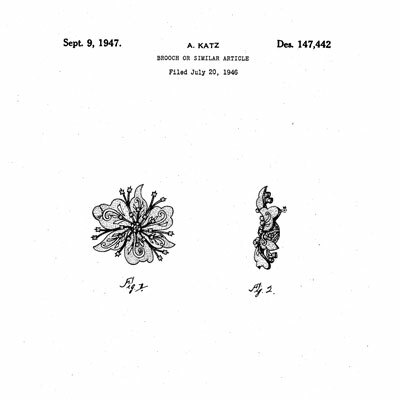 Scroll down to see similar brooches with a diamanté center (one has the pendant loop) as well as a bracelet with that design, all by the same maker. 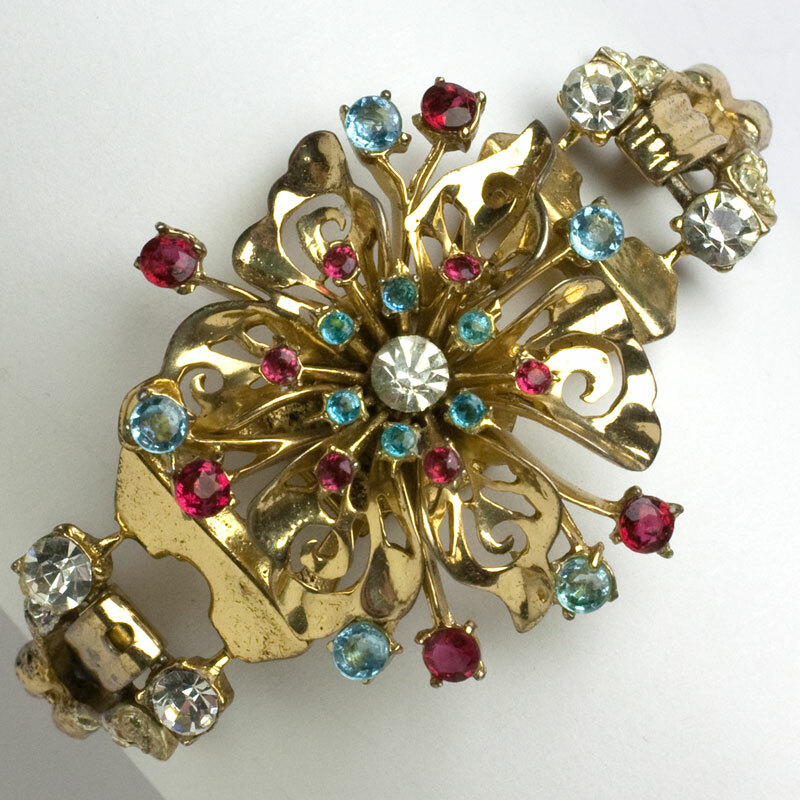 This substantial vintage flower brooch made from gold-plated sterling silver is adorned with aquamarine and ruby glass stones and a diamanté center – a fine example of the Retro Modern style. The petals of the flower are decorated with cut-outs and are tilted and slightly curled, giving them lots of life. Designed by the remarkable Adolph Katz, this piece can be worn as a brooch or pendant. One photo shows the pendant on a black cord, but you may prefer a gold chain. A 17-inch, 2mm black rubber cord with a stainless steel twist lock (just like the one in the photo) is included with this purchase. 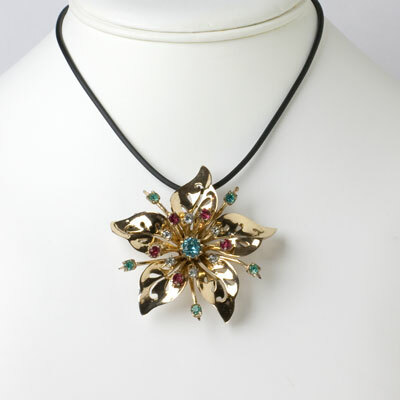 Scroll down to see the matching bracelet, a larger version of this brooch, and another brooch/pendant in the same design with a color variation. This 1940s gold-plated sterling silver bracelet has a double snake chain that fastens to a flower corsage with a fold-over clasp. The corsage is adorned with ruby and aquamarine glass stones along with a diamanté center. Two larger diamanté are at each end, and the snake chain attaches to the corsage with pavé links. Scroll down to see two brooch/pendants and a larger brooch in the same design by Adolph Katz. This substantial gold-plated sterling silver flower brooch adorned with aquamarine and ruby glass stones and a diamanté center is a fine example of the Retro Modern style. The petals of the flower have decorative cut-outs and are tilted and slightly curled, giving them lots of life. This lovely piece was designed by the remarkable Adolph Katz. This three-dimensional brooch is the larger version of two brooch/pendants and a bracelet in this design – scroll down to see them.